The Elephant Play Blankie is an adorable, exciting and interactive combination of a teething toy, a comfort blanket and activity toy all in one. Suitable from birth onwards, the Elephant Play Blankie has many entertaining features - perfect for keeping little ones entertained. 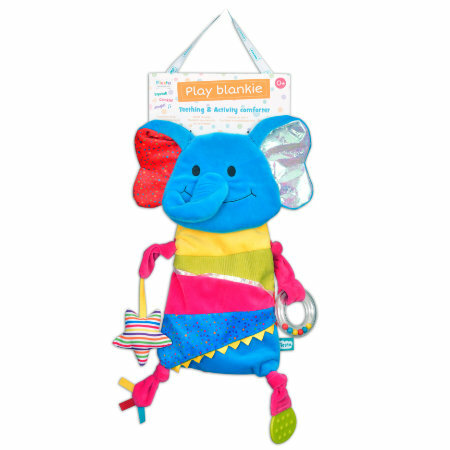 The Elephant Play Blankie appeals to multiple senses and to a babys need to be comforted. It is the perfect cuddling comforter, and even has two cords so that it can be tied on to a cot or buggy and provide comfort and entertainment wherever you go!